At the core of the Can-Am 2008 offering is the Outlander family of award-winning recreation utility models. The Outlander comes in 800, 650, 500 and 400 engine sizes. each the most powerful in its class and each available as a two-rider Outlander MAX version, anOutlander XT™ value-added package version, and an Outlander MAX XT version. The ultra-luxurious Outlander MAX 800 H.O. EFI Ltd. two-rider model is back with its collection of luxury touring features – built-in GPS receiver, winch system, mud guards, cast aluminum wheels, Steel Grey Metallic paint, and more. 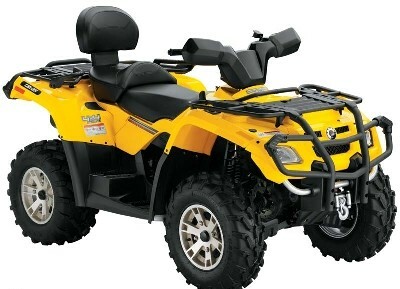 The recreation-utility category is a crowded one, but the Can-Am® Outlander™ stands out with more standard adrenaline than any other competitor. That’s because each Outlander model features the most powerful engine in its class, race-bred suspensions, the exclusive Visco-Lok front differential and other trick features. As you’re cruising the trails or hauling a load with the Outlander 800H.O.EFI, it’s cool to know you’re riding a GNCC and Baja 1000 champion. 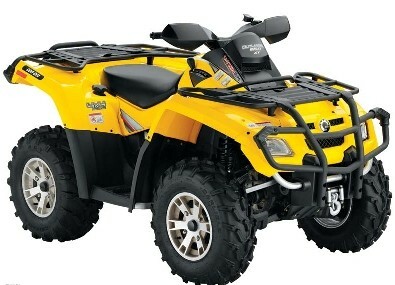 2008 Can-Am Outlander™ MAX 800 H.O. 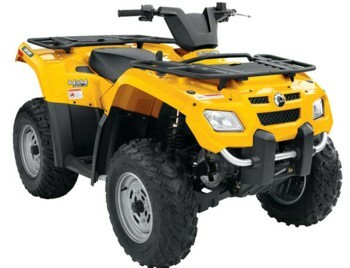 EFI Ltd.
Outlander MAX model – Outlander MAX models are designed specifically for riding with a passenger. The longer vehicle wheelbase not only delivers rocksolid stability and super predictable handling with a passenger, but one-up, too. Ability to swap seat and rack extension box without tools makes the MAX model extremely versatile. MODEL Outlander™ MAX 800 H.O. EFI Ltd.
-Am Outlander 800 H.O. EFI delivers performance features Outlander fans crave, like a suspension using TTI in the back and double A-arm in the front, Visco-Lok auto-locking differential for getting into - and out of - tough spots and the SST frame that virtually skis over logs, rocks and other obstacles. And just wait until you hear the purr of the 80-degree V-twin. This is what "most power in its class" feels like. 500 lbs. additional winch capacity (now 3,000 lbs./1,361 kg) on XT models . Outlander 650 H.O. EFI,The most power in its class with an impressive 42 percent more power than the Honda Rincon 680 EFI, 29 percent more than the Arctic Cat 650 and 20 percent more than Polaris 700 EFI. Lightweight and strong SST frame. State-of-the-art suspensions - double A-arm up front and TTI in the rear. Throw in the "go anywhere" capability of Visco-Lok front differential and you're ready to go pretty much anywhere. 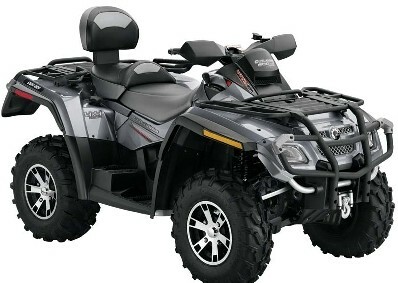 Outlander 650 H.O. The most power in its class with an impressive 42 percent more power than the Honda Rincon 680 EFI, 29 percent more than the Arctic Cat 650 and 20 percent more than Polaris 700 EFI. Lightweight and strong SST frame. State-of-the-art suspensions - double A-arm up front and TTI in the rear. The 500 H.O. EFI is a machine to be reckoned with. With 54 percent more power than Honda Rubicon 500, and even 22 percent more than the Polaris Sportsman 500 EFI, you can expect class-leading power, handling and performance every time you get on. Plus, it has all the great Outlander features, such as, Visco-Lok automatic front differential, SST frame, TTI rear suspension and more. There's the segment's most powerful engine with 47 percent more than the Honda Rancher AT, 30 percent more power than a Suzuki Eiger and 11 percent more power than the Polaris Sportsman 450. The Outlander 400 H.O. is still the class leader in power and performance. 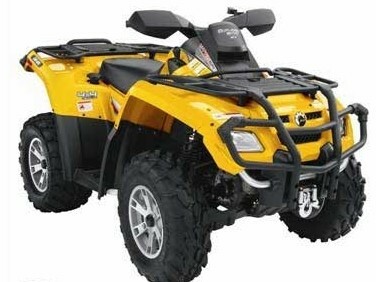 2008 Can-Am Outlander™ 400 H.O.